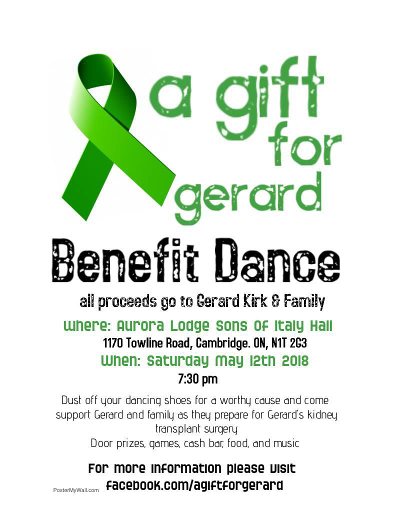 Please consider supporting CLGW’s staff, Laura Kirk and her husband Gerard in his kidney transplant journey. Get a group of friends together for a night out to support a great cause with great food, dancing, prizes, a photo booth and games! Some spectacular prizes include 3 getaway weekends, Blue Jay tickets and local artwork. Both Laura and Gerard have served the local developmental sector for more than 20 years! Regular tickets are $15 each or for those not able to attend but wishing to support the cause, there are $10 donation tickets and you will still be entered into door prize draws! Please contact Jackie Tangie at the Ajax Program for tickets. They are going fast!